Kristin Towers-Rowles grew up in Los Angeles amidst a family of actors and singers. Her grandmother is the MGM Musical actress/singer Kathryn Grayson (Kiss Me Kate, Showboat, Anchors Away, and Camelot on Broadway). Her grandfather, Johnnie Johnston, was the star of A Tree Grows in Brooklyn on Broadway and was a popular recording artist in the 1940's. Kristin’s mother grew up the child of these two stars and was a great actress/singer in her own right. Her parents met when her father, Robert Towers, was playing Snoopy in the LA Production of You're A Good Man, Charlie Brown at the Ivar Theatre, right down the street from AMDA LA. Mr. 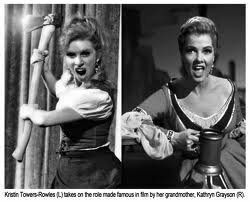 Towers has acted in hundreds of plays and musicals and has been in many TV Shows and Films. Notably he played the older Benjamin in the film The Curious Case Benjamin Button. Kristin came to AMDA at nineteen to pursue her own theatrical dream. After an impressive start to her stage career, everything changed abruptly when she was injured in a show. Told she couldn’t go back to performing, she left the theatre and started a family. After seven long years away Kristin knew she couldn't give up her passion any longer. Kristin talks about her journey and what it has been like to return to the stage. When did you decide you wanted to be an actress and pursue musical theatre? I grew up surrounded by all of this. My parents LOVE Sondheim and as a child, I knew the lyrics and difficult rhythms to all of Sondheim's shows. I also listened to all Cy Coleman shows and little known works like "Goodtime Charlie." I basically lived and breathed musicals my whole childhood. Whenever my family had troubles and I would go in my room and listen to musicals, playing every part. As I got older, it was apparent to everyone that this was also my gift. I was accepted to Hollywood High Performing Arts Academy and was the star of every show. I knew that this was what I was born to do. Tell us about how you came to AMDA? I was at Hollywood High when I saw the AMDA NYC poster (this is long enough ago that there wasn't even an AMDA in LA yet) and decided that I wanted to go there. It was perfect—an intensive program that focused on all of the things a well rounded performer needed. Even though I grew up in LA, I was really only interested in being onstage. After graduating High School (Best Actress/Class Vocalist), I went to Santa Monica College for a year and in that time auditioned for AMDA and got in with a partial scholarship. I was so excited to be in New York and never thought twice about moving there at 19 years old! I get teary just thinking about my time at AMDA. All I can say is that it was the best two years of my life. I loved living in student housing, walking down the street in New York to get to class. The classes were amazing. I loved that we got to travel as a group through our semesters and see each other grow and take chances. I loved that my teachers were all people who had been through the ups and downs of the business and could offer real world advice and I loved that it was process oriented, not results oriented. I was someone who was coming from LA with a whole family in the industry and I was in class with students from small towns in the mid west, yet we were all in the same process. I always felt safe to take chances and was encouraged to do so. I made lifelong friends who, to this day, are still some of my best friends. The thing that most stuck with me however was the Dossier that Michael Sartor gave us. It was what we used to break down our songs in the 1st and 2nd semester. It has been with me through every rehearsal process and every song I sing, since my very first "I Want" song at AMDA (which was, "In My Own Little Corner" from Cinderella). It is genius and so was he. What were your goals as a student? I was, in many ways, very young and was not very driven to be career oriented. I just wanted to be as great as possible at my craft. This has always been my downfall. I didn't want to see something I loved as a business. But it is! So, my true goals shifted when I realized that as much as I loved this, I needed to be skilled and technically sound. I really embraced technique. Like, for example, a falling inflection at the end of a phrase. I see many great actors, who are very talented, make that mistake all of the time. It is a technical thing but it matters. The other thing I really wanted to do was to be as strong of a musician as I was an actress. I am also a pretty decent dancer but at 5ft tall, I knew I'd never be a show girl. I wanted to have the perfect marriage of acting and singing - seamless and real. I strive for this every time I walk on a stage. I stayed in New York for a few months and then moved back to LA. I loved living there but business-wise, it made more sense for me to be in LA. I had connections in LA and an agent who wanted to work with me. So I came home and within a week, had a roommate, an apartment, an agent and was up for a big TV show on Disney Channel. And while this was all well and good, my heart ached for the stage. So, I began auditioning for theatre projects, first locally and then for Non-Union National Tours. I booked my first tour, HMS Pinafore and then did seven National Tours in four years, worked on a Cruise Ship, toured Taiwan with Phantom of the Opera/Les Miserables in concert singing Christine/Cossette and went to Europe where I got to sing Christine again. I took a National Tour of Veggie Tales Live and that was when my life changed. My costume weighed 50 lbs. and pushed a disc out of my back. When I came back to LA, I was told I'd never be onstage again. I was 27. After that, I decided to settle down and get married. I wanted something normal and constant and my husband is a great guy. We got married and 26 days into our marriage, I got pregnant with baby #1. Then we had babies #2 & #3. Before I knew it, I was a married woman with 3 daughters and performing was just a thing of my past. As many artists face the dilemma of how to balance family and career, you made the choice to set aside your career for a time in order to raise a family. Was that a difficult for you? When my youngest was a year old, my heart was longing to go back to my craft. I was back in touch with some of my theatre friends and got cast as one of the leads an operetta, The Gondoliers. It was very hard to cook dinner, leave my kids and get to rehearsal. However, having been away from my craft for 7 years, I had also realized that it wasn't just the acting and singing that I missed, it was my tribe and my people. We theatre people are a special breed and I was so far from my kinfolk. I was trying to make friends with other moms (most of whom did NOT get me) and just be "normal." I couldn't put it into words then but now I realize that I am a very unique person because of my being raised in the theatre. Yes, I'm a mom but I don't have to fit into someone's "box" of what a mom is. I still have my own hopes, dreams, talents and I decided that my daughters would best be served growing up with a fulfilled mom, one who was still doing what she was supposed to do, following her bliss and using her craft. Who didn't let having children or being a certain age stop her from using her God-given talents. When you decided to return to your career, how did you go about getting back into the world of performing? I just started putting myself out there. I auditioned for stuff in Backstage West and started getting cast again. I was surprised that after having kids and being nearly a decade older, I was still getting cast as an ingenue and leading lady. I worked very hard to lose my baby weight so I don't look like a typical mom of three and I got very involved with a Theatre Company in San Pedro called "The Relevant Stage" at the gorgeous Warner Grand Theatre. In 2011, I did Kiss Me Kate there on the 1 year Anniversary of my grandmother's death. 2011 turned into a huge year for me. I won "Breakthrough Musical Theatre Performer of the Year", "Best Actress in a Musical" (Dot/Marie - Sunday in the Park with George) and "Outstanding Performance by a Lead Actress in a Musical" (Lillie Vanessi/Kate in Kiss Me Kate and Winnifred in Once Upon a Mattress) from StageSceneLA. 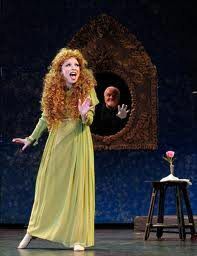 I am also nominated for two Broadway World Awards, "Best Actress in a Musical" (Kiss Me Kate) and "Best Female Cabaret Performer of the Year" (for my solo show, A Lovely Lineage, which I am performing again at Sterling's at Vitellos in February 2012). Recently you have played numerous theatrical roles around the LA area, receiving several awards and nominations. This seems to be quite a validation of your return. How does that feel? It feels like a dream. There were literally years of my life where I ached so much for my craft to just be a part of my life again. I LOVE my children and my husband but I was a shell of myself without having theatre in my life. The fact that I have been given all of these opportunities and continue to get to play dream roles and get awards for them, is just simply amazing. I think it is ironic that I was called a "Breakthough Performer" - it is such a telling decription. I've had to breakthrough a health scare with my back, prejudice that comes from me being a mom/wife, my own fears about how I will be received, having a lack of a peer group - people in my stage of life still doing this. But then again, I am experiencing a renaissance of sorts, so breakthrough is right on the money! Tell us about your next show, Little Women? You will play Meg March and your father is also in the cast. How does it feel to be able to perform with him? Our show is a benefit called Haven to Haven. Haven Academy of the Arts (a young person performing arts school in El Segundo) is partnering with a safe haven house for women who are rescued from domestic trafficking industry in the US. We are doing this show to raise money to help fund the building of the shelter. My father is playing Mr. Lawrence. I am so excited to work with him again. We did a National Tour together of The Mikado and we've done some local theatre together but nothing like this. It means the world. What advice do you have for AMDA students and alumni who have taken time away, or are thinking of doing so, to pursue other interests? I think it's great to take a break, if you need to. But I also think that if your heart is broken because you aren't doing what you love anymore, life is too short not to remedy that. Only you can go to the audition and book the job. I had a great teacher at AMDA, Tim Fauvel, who said to us on the very 1st day: "If you can do ANYTHING else and be happy, GO DO IT. This business is too hard if you aren't going to be 100% committed." That is really true. It's not a bad thing that you want to do other things, just know that this business takes 100% commitment and nothing less. The other thing I would say is that you are a necessary type, no matter what age you are. If you left an ingenue and now you are a mom type, so be it! Embrace it and roll with it. Work is work. But don't think that you aren't necessary just because you aren't 22 anymore. There is room for all of us! And the truly meaty roles are usually for the more seasoned actors anyway. Now that you have some life experience behind you, what is your ultimate career goal? My ultimate career goal is to be an actor who continues to stretch and grow, who challenges myself to audition for things I've always wanted (even if I don't think they'll cast me) and to always be moving forward. I never want to sit back and pine for when I was a kid/younger, but instead to look my reality square in the eye and tell it to get out of my way. I want to earn the respect of those I truly admire, as an artist and as a person. I want to have artistic integrity, make work I can be proud of and hope that work begets more work. I want to do musical theatre, the only true American Art Form and do it well. There are so many things you can not control in this business but I want to be amazing at what I can control - and that is being 150% reliable, on my game and stellar at my craft. Thank you so much for taking the time to share your experience with us Kristin.